As I round a corner and start back up the dark hillside that marks the start of mile 36, my headtorch picks out a figure doubled over at the side of the track. “OK dude?” The response is a heave and the splatter of vomit. He wipes his face and displays a rictus grin before setting off running again. I’ll take that as a ‘don’t ask’. Mention Brecon and you would likely summons images of soldiers trudging up hillsides with enormous packs. The area is renowned for its toughness and challenging conditions. 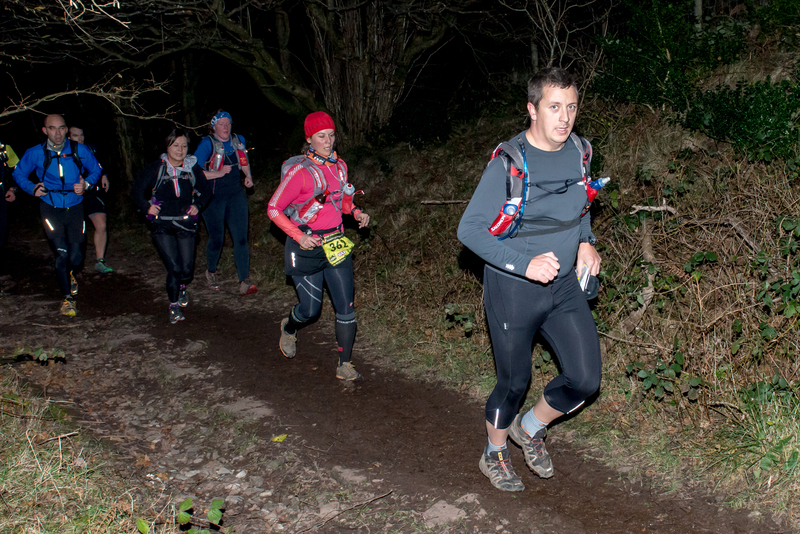 It is also the host to a 42-mile ultra marathon – one of the Welsh Ultra Running Series, the Brecon Winter 40. The start, below Tal y Bont reservoir, is understated. A quick race brief, then we’re off up a track in to the dark. The route is well marked – no navigation is required today, though we all carry map and compass in case the visibility closes in – and the stream of faster runners leads us on. The first 12 miles are a mix of steep climbs, painful descents and flat stretches. 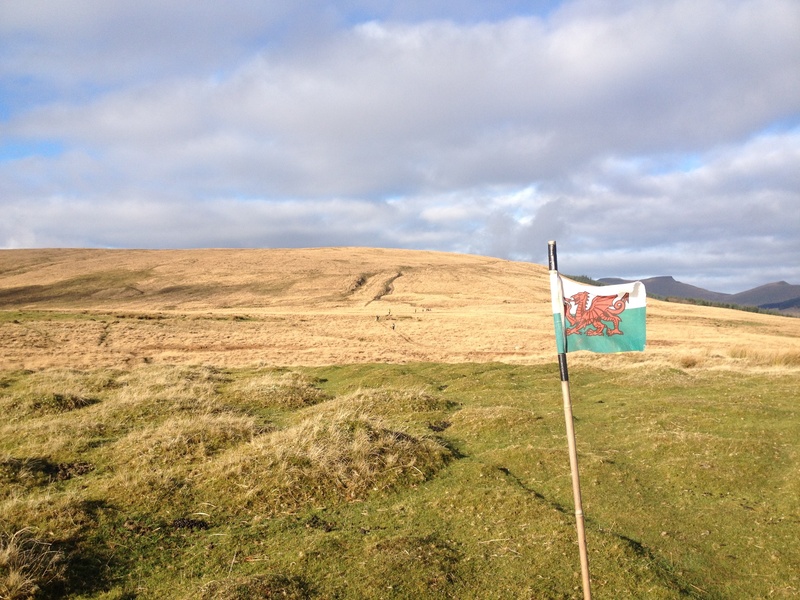 By 15 miles I’m starting to feel the lack of training and my pace drops off – I cross a dam and cross a featureless moorland marked with Welsh flags. Not even halfway. I feel the impact of those first steep descents with every downward step now – toenails being driven repeatedly back in to nail beds. I refill my soft flasks with water at the CP and aim for a forestry track with my head firmly down. People are coming past me every couple of minutes now, which is making me feel worse. I eat on the move and swallow some painkillers for my feet, hoping they’ll work quickly. After walking a 5-mile climb, I run the last few metres downhill to the road and summon a smile (mostly because of the photographer I can see hiding behind the footbridge), but I know I’m close to withdrawing. I hadn’t counted on the chirpy marshals’ infectious good humour as I stumble in however. 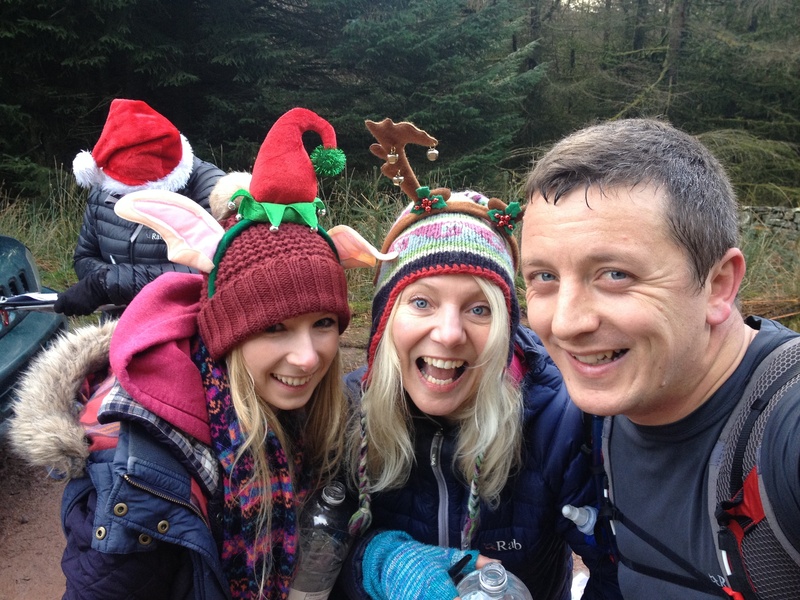 Being close to Christmas, they’re all wearing comedy antlers, Santa hats and big grins. Hugely lifted by their banter, I grab a photo with them and, pride being at stake, set off running again up the hill. I pass 2 runners tucking in to the Storey Arms Burger Van’s finest fare, but decide against partaking. The marshals’ enthusiasm has rubbed off and my food and brufen have finally kicked in, so I head up the Pen Y Fan path at a slightly faster pace. The wind over the ridge is vicious and the night is closing in as I descend off the shoulder of Corn Du. I catch a small group of guys descending to the CP and we set off along the road section at a steady jog. I stop to get my headtorch out, and soon find myself running alone through dark fields. I can see lights ahead that are helping me navigate, and I adopt a walk-run to catch them. I pass one of the burger van guys just as he’s bringing up his dinner. The last few miles are a seesaw traverse along the steep hillside. The 12-hour finish is almost within reach, and I push for it for no better reason than because. 3 of us run in the last 2 miles along the road to cross the line together. The majority of us start knowing that we won’t win; indeed, the winner will be home and showered several hours away before we cross the finish line. For most, it is a personal challenge, with a certain time, or just a finish as the target. Many, like myself, are taking this final opportunity to gain much needed points for that chance to earn a coveted Ultra Trail du Mont Blanc place for 2014. A month later, I’m on exercise and hunting around a hillside for 3G signal to check the entry list on the UTMB website. I type in my name: Refused. My name hasn’t been one of the 2000 drawn from the hat this year. Of 363 British entries, 155 don’t have a place. My entry will be carried to next year, with double the chance of being drawn. I have an extra 12 months to train and get fitter. None of this is of any consolation. I am gutted. Next year. This event is run by www.mightcontainnuts.co.uk, and is without doubt one of the most friendly and well-organised races I’ve run. 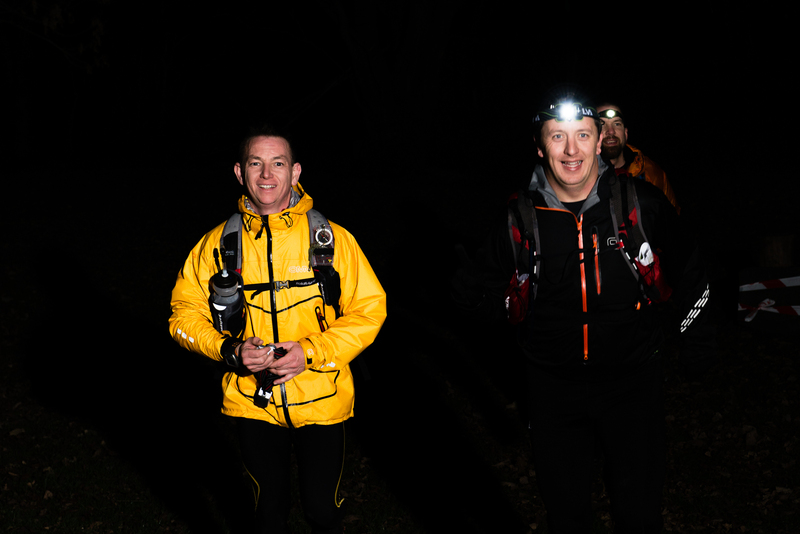 The map and route were clear, the marshals were friendly and helpful, and the route was challenging but rewarding. Thanks MCN!